The ancient Irish were Celts who had migrated to the Irish isles from Central Europe nearly two thousand years before the coming of Christianity to Ireland. Their unique language was called Gaelic, which still survives to this day and is widely spoken by the Irish. The Gaelic language was written using a special alphabet called the ‘Celtic Tree Alphabet’ which comprised of letters that signified trees found in abundance on Irish soil such as the oak tree and the fir tree. The Ogham script, which was the lettering of old Gaelic, is the basis of Irish Gaelic tattoos of alphabet symbols. The symbols of the alphabets in Ogham script was drawn as a series of vertical, horizontal and perpendicular lines. Each symbol signified an alphabet and a corresponding tree. The ‘A’ alphabet was called ‘Ailm’ and stood for the fir tree. It’s unique symbol was also a cross with equidistant arms within a circle. Irish Gaelic tattoos of the ‘Ailm’ connoted purity, as the fir tree was synonymous with purity and considered sacred. Irish Gaelic tattoos also made use of spirals, crosses and knots to an extensive degree. The Celtic Cross was a sign used by the Druids as a symbol for life and eternity. This symbol was later appropriated by Christian missionaries who lengthened the arms and made the sign a symbol of the Crucifixion. The winter solstice, which fell on December 25 each year, and was a crucial festival for the ancient Irish Gaelic people to celebrate the season, was made the date of the birth of Christ. In this manner, Christian evangelists assimilated the Irish Gaelic pantheon to represent key celebrations of the Christian faith and encourage the conversion of Gaelic nature worshippers to a homogenous theological path. Some of the more common Irish Gaelic tattoos are the Celtic Knot which is a stylized knot of interlacing patterns that explained how human lives were interconnected with the natural world. It was a symbol of protection and was worked into metal shields of warriors. The arrow knot is another tattoo form that is made of knots designed to look like an arrow head. This was a favorite tattoo of warriors and was famously known as the Brotherhood of the Arrow. 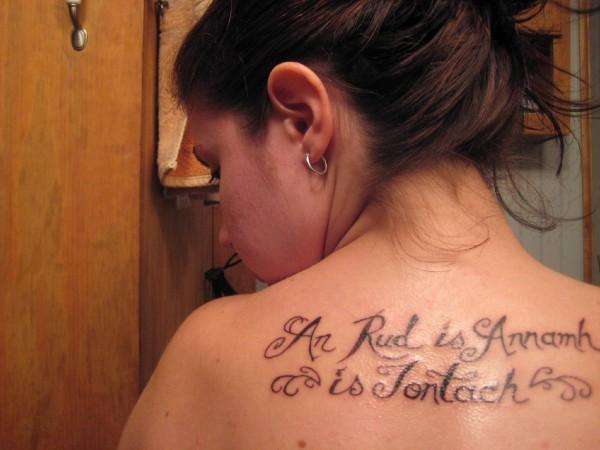 Irish Gaelic tattoos are remarkable in their breadth of coverage and design. The symbols and signs of Gaelic tattoos are unique to ancient Irish culture. They display a rich and varied Irish heritage.